Computed tomographic fluoroscopy was first introduced for clinical use in Japan in 1993. The first North American scanner installation was in 1994 and the U.S. Food and Drug Administration approved its use in 1996 . Currently, five vendors provide CT fluoroscopic capability. Our clinical experience has been with the Toshiba Xpress/SX Aspire CI System (Toshiba Medical Systems, Tokyo, Japan). Figure 1 Photograph of the CT fluoroscopy suite that demonstrates the integrated monitor (arrow), control panel (arrowhead), and gantry. Note the sterile cover over the control panel that permits the radiologist to operate the CT fluoroscopy system and manipulate the catheter without compromising sterile technique. (From Ref. 15). Fluoroscopic CT employs slip-ring technology and can be adapted for use with multislice CT [2,3]. Real-time visualization is accomplished with a fast parallel processor system that permits management of large quantities of data and allows for real-time reconstruction in a 256 X 256 matrix. On our system, after collection and processing of the first 360° of data, each subsequent 60° of data (0.17 sec) are added to the existing data and replace the oldest 60° of data. The first image is displayed 1.17 sec after initiation of CT fluoroscopy. As a result of continuous updating, six images are displayed per second, each reflecting an accumulation of 1 sec of data. The rapid updating of images imparts a real-time effect. A maximum of 100 sec of continuous CT fluoroscopic imaging can be performed and 800 sec of raw data can be stored on the hard drive. A control panel and monitor are located in the scanning room and can be moved freely to allow the radiologist, wearing a standard fluoroscopic lead apron for protection, to acquire and view CT images optimally without leaving the scanning room (Figs. 1 and 2). The control panel allows selection of the laser light and adjustment of table position, height, and gantry angle. Movement of the table is accomplished with either a joystick on the control panel or a manual sliding mode, which permits the operator to slide the table freely. A button on the control panel or a foot-pedal identical to that used for routine fluoroscopy allows activation of real-time imaging. Figure 2 Computed tomographic fluoroscopy control panel. The left joystick adjusts gantry angle and the right joystick controls table movement. Additional functions include power, laserlight, localizer, table height, free-hand sliding mode table position, and emergency weight-off switch. By placing sterile drapes on the control panel and the foot of the table, the radiologist can view and perform the entire procedure without assistance. Alternatively, an assistant can operate the monitor and table. 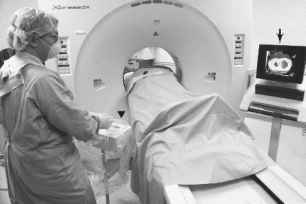 Radiation dosimetry is an important consideration when using CT fluoroscopy. Typical radiation dose factors are 80-120 kVp and 30-50 mA/sec. Adjustments are made for the size of the patient and the area being imaged. 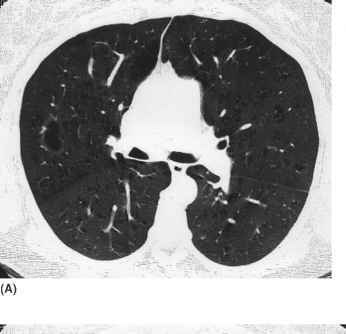 In the lungs the high contrast between aerated lung and lung abnormalities may permit reduced dose parameters. A dedicated filter allows reduction of dose by 50% compared to that of conventional CT. Absorbed skin dose using a body phantom approximates 20 cGy for an exposure of 50 sec using 120 kVp and 50 mA. Most interventional thoracic procedures require less than 3 min of CT fluoroscopic time .